Joe started his career in education as a high school English teacher, and has dedicated his professional life to the improvement of the public education system. Throughout his legal career he has represented numerous public school boards of education, as well as charter schools and State colleges. Joe handles all matters for school board clients including labor and employment, student rights, civil rights, public contracting, special education/due process, legal compliance, HIB, FERPA, OPRA, OPMA and related litigation. Joe has extensive experience in all areas of education law, regulatory law, and public governance, including litigation in all subject matters affecting boards of education. 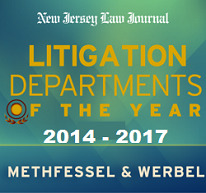 He regularly represents school boards before the New Jersey Office of Administrative Law, State and Federal Court, the New Jersey Commissioner of Education, the Public Employment Relations Commission, the Government Records Counsel, the New Jersey Division on Civil Rights, and the U.S. Department of Education. Joe will work on the Employment/Civil Rights team chaired by Eric Harrison.